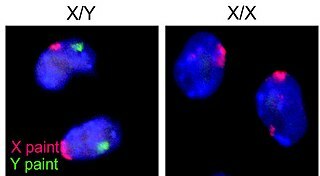 Ploidy is the number of complete sets of chromosomes in a cell, and hence the number of possible alleles for autosomal and pseudoautosomal genes. Prenatal development includes the development of the embryo and of the fetus during a viviparous animal's gestation. Prenatal development starts with fertilization, in the germinal stage of embryonic development, and continues in fetal development until birth. Gestational age is a measure of the age of a pregnancy which is taken from the woman's last menstrual period (LMP), or the corresponding age of the gestation as estimated by a more accurate method if available. Such methods include adding 14 days to a known duration since fertilization, or by obstetric ultrasonography. The popularity of using such a definition of gestational age is that menstrual periods are essentially always noticed, while there is usually a lack of a convenient way to discern when fertilization occurred. First attested in English in the mid-14c., the word embryon derives from Medieval Latin embryo, itself from Greek ἔμβρυον (embruon), lit. 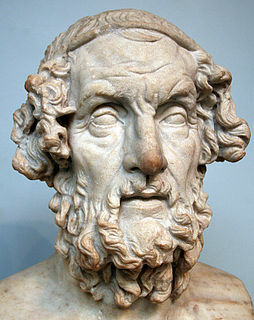 "young one",  which is the neuter of ἔμβρυος (embruos), lit. "growing in",  from ἐν (en), "in"  and βρύω (bruō), "swell, be full";  the proper Latinized form of the Greek term would be embryum. Latinisation of names, also known as onomastic Latinisation, is the practice of rendering a non-Latin name in a Latin style. It is commonly found with historical proper names, including personal names, and toponyms, and in the standard binomial nomenclature of the life sciences. It goes further than romanisation, which is the transliteration of a word to the Latin alphabet from another script. Diploblasty is a condition of the blastula in which there are two primary germ layers: the ectoderm and endoderm. Triploblasty is a condition of the blastula in which there are three primary germ layers: the ectoderm, mesoderm, and endoderm. A fourth "layer" consists of the germ cells that are set aside in the embryo at the blastula stage, which are incorporated into the gonads during organogenesis. The germ layers form during gastrulation of the blastula. Additionally, the term may refer to any ovum in which the blastoderm splits into three layers. During organogenesis, molecular and cellular interactions between germ layers, combined with the cells' developmental potential, or competence to respond, prompt the further differentiation of organ-specific cell types. [ citation needed ] For example, in neurogenesis, a subpopulation of ectoderm cells is set aside to become the brain, spinal cord, and peripheral nerves. Modern developmental biology is extensively probing the molecular basis for every type of organogenesis, including angiogenesis (formation of new blood vessels from pre-existing ones), chondrogenesis (cartilage), myogenesis (muscle), osteogenesis (bone), and many others. Neurogenesis is the process by which nervous system cells, known as neurons, are produced by neural stem cells (NSC)s, and it occurs in all species of animals except the porifera (sponges) and placozoans. Types of NSCs include neuroepithelial cells (NECs), radial glial cells (RGCs), basal progenitors (BPs), intermediate neuronal precursors (INP)s, subventricular zone astrocytes, and subgranular zone radial astrocytes, among others. Neurogenesis is most active during embryonic development, and is responsible for producing all the various types of neurons of the organism, but continues throughout adult life in a variety of organisms. Once born, neurons do not divide, and many will live the lifetime of the animal. In botany, a seed plant embryo is part of a seed, consisting of precursor tissues for the leaves, stem (see hypocotyl ), and root (see radicle ), as well as one or more cotyledons . Once the embryo begins to germinate—grow out from the seed—it is called a seedling (plantlet). ↑ "embryo". Mayo. Archived from the original on 20 February 2016. Retrieved 21 February 2016. ↑ Boscá, S; Knauer, S; Laux, T (2011). "Embryonic development in Arabidopsis thaliana: from the zygote division to the shoot meristem". Frontiers in Plant Science. 2: 93. doi:10.3389/fpls.2011.00093. PMC 3355580 . PMID 22639618. ↑ Freedman, Jeri. "America Debates Stem Cell Research." New York, NY: The Rosen Publishing Group, 2008. ↑ Sandel, Michael J. "The Case Against Perfection." Michael J. Sandel, 2007. ↑ Zavos, Panayiotis. "Reproductive Cloning is Moral." Ed. James Woodward. The Ethics of Human Cloning: At Issue. Farmington Hills, MI: Greenhaven, 2005. 14–24. ↑ Morelle, Rebecca. "Dinosaur embryo fossils reveal life inside the egg". BBC News. Archived from the original on 24 September 2015. Retrieved 8 August 2015. ↑ Conrad Stöppler, Melissa. Shiel Jr., William C., ed. "Miscarriage (Spontaneous Abortion)". MedicineNet.com. Archived from the original on 2004-08-29. Retrieved 2009-04-07. ↑ Kärkkäinen, Katri; Savolainen, Outi; Koski, Veikko (1999). "Why do plants abort so many developing seeds: bad offspring or bad maternal genotypes?". Evolutionary Ecology. 13 (3): 305–317. doi:10.1023/A:1006746900736. Wikimedia Commons has media related to Embryology . Developmental biology is the study of the process by which animals and plants grow and develop. Developmental biology also encompasses the biology of regeneration, asexual reproduction, metamorphosis, and the growth and differentiation of stem cells in the adult organism. A gamete is a haploid cell that fuses with another haploid cell during fertilization (conception) in organisms that sexually reproduce. In species that produce two morphologically distinct types of gametes, and in which each individual produces only one type, a female is any individual that produces the larger type of gamete—called an ovum —and a male produces the smaller tadpole-like type—called a sperm. 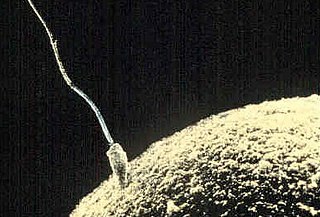 In short a gamete is an egg or a sperm. This is an example of anisogamy or heterogamy, the condition in which females and males produce gametes of different sizes. In contrast, isogamy is the state of gametes from both sexes being the same size and shape, and given arbitrary designators for mating type. 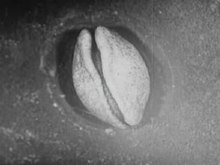 The name gamete was introduced by the Austrian biologist Gregor Mendel. Gametes carry half the genetic information of an individual, one ploidy of each type, and are created through meiosis. Fertilisation or fertilization, also known as generative fertilisation, insemination, pollination, fecundation, syngamy and impregnation, is the fusion of gametes to initiate the development of a new individual organism or offspring. This cycle of fertilisation and development of new individuals is called sexual reproduction. During double fertilisation in angiosperms the haploid male gamete combines with two haploid polar nuclei to form a triploid primary endosperm nucleus by the process of vegetative fertilisation. The egg cell, or ovum, is the female reproductive cell (gamete) in oogamous organisms. The egg cell is typically not capable of active movement, and it is much larger than the motile sperm cells. When egg and sperm fuse, a diploid cell is formed, which rapidly grows into a new organism. A sporophyte is the diploid multicellular stage in the life cycle of a plant or alga. It develops from the zygote produced when a haploid egg cell is fertilized by a haploid sperm and each sporophyte cell therefore has a double set of chromosomes, one set from each parent. All land plants, and most multicellular algae, have life cycles in which a multicellular diploid sporophyte phase alternates with a multicellular haploid gametophyte phase. In the seed plants, (gymnosperms) and flowering plants (angiosperms), the sporophyte phase is more prominent than the gametophyte, and is the familiar green plant with its roots, stem, leaves and cones or flowers. In flowering plants the gametophytes are very reduced in size, and are represented by the germinated pollen and the embryo sac. 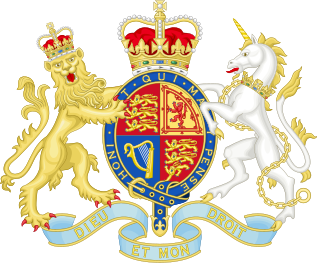 The Human Fertilisation and Embryology Act 1990 is an Act of the Parliament of the United Kingdom. It created the Human Fertilisation and Embryology Authority which is in charge of human embryo research, along with monitoring and licensing fertility clinics in the United Kingdom. The beginning of human personhood is the moment when a human is first recognized as a person. There are differences of opinion as to the precise time when human personhood begins and the nature of that status. The issue arises in a number of fields including science, religion, philosophy, and law, and is most acute in debates relating to abortion, stem cell research, reproductive rights, and fetal rights.